The Tyler RO-TAP Sieve Shaker is the industry standard. The RO-TAP’s unique action produces accurate, and equally important, consistent particle analysis testing results. It is designed to be used in a stationary testing environment and requires very little maintenance. 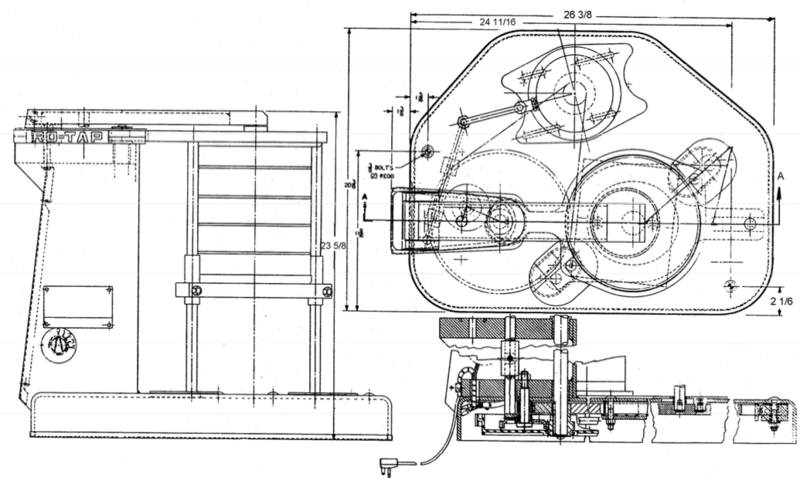 Mechanical action is applied to the testing sieves in two dimensions. First, a horizontal circular motion and second, a vertical, tapping motion. Combined, these actions allow material particles to stratify and seek critical openings in the screening media. These uniform mechanical movements allow for dependable and reproducible test results. The RO-TAP is recommended for testing in applications requiring analysis for particles 635 mesh or coarser. The standard unit is designed to take 8″ diameter sieves. Adaptors are available to test with 3″, 4″, 5″, 6″, 10″ and 12″ diameter screens. Regardless of diameter, any one material sample can be tested on a series of 7 full height (2″) or 15 half height (1″) sieves at one time, plus bottom pan and top cover. 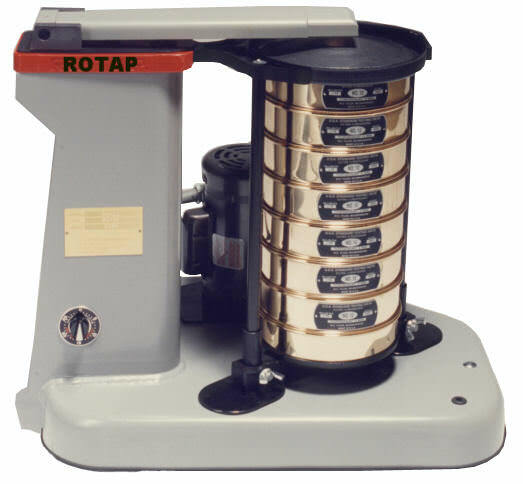 The RO-TAP is operated by an enclosed, vertically mounted 1/4 HP electric motor. The standard unit is wired for use with single phase current, 60 cycle, 100 volts. In addition, the RO-TAP can be wired for 50 cycle current and or 220 volts. Each unit is supplied complete with its own built in 30 minute timer and an operation, maintenance and parts manual. The RO-TAP is 28 inches wide, 21 inches deep and 25 inches high. The machine weighs 180 pounds. A dust/sound enclosure and a wet sieving kit for 8 inch diameter sieves is also available for the RO-TAP. 040B-010 Rotap, Mdl. B, 8″ Dia Sieves, 110 V/1 Ph/60 Hz 13 Ft³ 210 Lbs. 040B-011 Rotap, Mdl. B, 8″ Dia. Sieves, 220 V/1 Ph/50 Hz 13 Ft³ 210 Lbs. 040B-012 Rotap, Mdl. B, 12″ Dia. Sieves, 110 V/1 Ph/60 Hz 13 Ft³ 210 Lbs. 040B-013 Rotap, Mdl. B, 12″ Dia. Sieves, 220 V/1 Ph/50 Hz 13 Ft³ 210 Lbs. 040B-015 Wet Sieve Kit, 8″ Dia. Sieves 1 Ft³ 40 Lbs. 040B-016 Sound Enclosure For Ro-Tap 16 Ft3 100 Lbs.